You'll love it Guaranteed. See details. 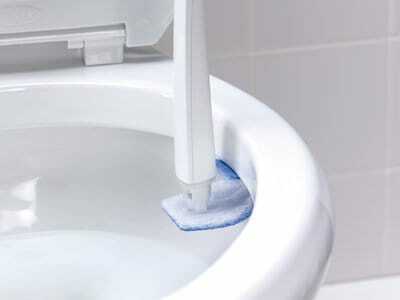 Scotch-Brite® Disposable Toilet Scrubber is rated 3.0 out of 5 by 168. Rated 1 out of 5 by cindyf11 from Lousy excuse for a scrubber This is the worst piece of junk they could have come up with! If I could give it no stars, I would. The old scrubber worked great but has been discontinued in my area so I ended up having to buy the "new" model. Yeah, it scrubs under the rim but that's all it does. it's almost impossible to scrub the whole bowl and you can't get at anything down in the hole. You have to sort of force it to wipe sideways because there's nothing at all on the sided of this "scrubber" except a big empty space! You can do better with a big wad of toilet paper and your hand! Bring back the old scrubber refills!! I am returning this piece of junk to the store tomorrow. Rated 1 out of 5 by Sammy11 from Be aware! I recently moved into a new house so I have decided to try something new out to clean my toilet bowl. I bought this scrubber and turns out its a faulty product. While i was scrubbing the toilet bowl, the blue scrubbing piece fell off and went down into the drain. I forced my hands in there to grab it out but im pretty sure it traveld very far back so i couldnt even do anything about it. I had to call the plumbing service on a weekend which costed me $200 for suctioning and repair. This has got to be the worst yet. So becareful about buying a faulty scrubber. It may stick on the first 5 seconds but if it falls off without your knowledge, good luck! Rated 1 out of 5 by susan543 from I'm so disappointed! I just loved the old style Scotch-Brite toilet scrubbers, but my local store stopped carrying them and switched to this new style. I'm so disappointed! The new shape is much more awkward to use and took longer to manipulate it to clean all the surfaces. 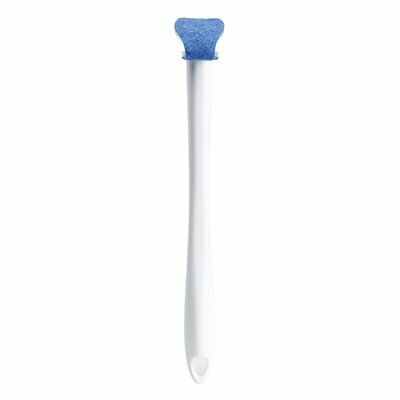 The blue cleanser makes the water opaque so that it's hard to see if you've cleaned the underwater surfaces sufficiently. The old style didn't do that. The new caddy is nice, but that doesn't outweigh the negatives. Plus it's more expensive. I won't buy this again. If I can't find the old style scrubber, I'll be looking for a new brand. Rated 1 out of 5 by Creedcrest from Please go back to previous design!!! I was forced to buy this design after they revised their previous product. It does not clean my toilets nearly as well as the previous model. As soon as I use them up, I will purchase from a different company. While if I scrub repeatedly under the rim it does clean that portion of my toilet, the rest of the toilet remains in need of additional scrubbing. I finished cleaning the toilet, only to find grime in the bowl remaining. I scrub my toilets once a week, so it isn't as if they need more than one refill at a time. I'm so disappointed that you revised this, and I suspect it is because the previous design was strong enough to use more than once. I won't purchase this again. Rated 1 out of 5 by A Domestic Engineer from Out with the NEW! Bring back the OLD!!! The new Scotch Brite toilet scrubber design needs to be flushed down the toilet! I searched every store in my area for the old refills before reluctantly trying the new ones. The old design was a favorite at my house for years...so easy & efficient that even my teenagers cleaned their toilets! We were all disappointed to learn that the new design just doesn't get the job done the same & is awkward to use. Cleaning under the rim was easily done with the old ones, so I'm confused about the reasoning behind a completely new design. I do like the new refill container and the way the refill comes off the handle with the push of a button, but it's not enough to make me buy them again. Please bring back the OLD refills! Rated 1 out of 5 by SBL08 from Disappointed I did not want to buy a new scrubber, but my store does not carry the old style anymore. I do not like buying more plastic, and the storage container is a waste of plastic for me. While using the first scrubber from the refill box the scrubber fell off in the toilet and went into the plumbing and was very difficult to get out. The scrubber itself does not work as well as the old style. I will not buy this again, and will not be using the remaining scrubbers I have, I don't want to take a chance on it falling off in the toilet again. Rated 1 out of 5 by Cathilynnk from Terrible ! I purchased these because the store I was in didn't have the original ones. These are awful compared to the big blue ones. I really love the original ones because you can squish it under that little hole underneath the seat and lid to get that bit of porcelain that boys know how to get too. Anyway, the design on these new ones is just worthless. It feels like you can't get any coverage because there is only that thin little strip. The original ones are way better because you get a 360 degree coverage. I'm disappointed I spent $10 on this.